The searing heat of the flame hit me like a wall of burning wind, but I didn’t care. 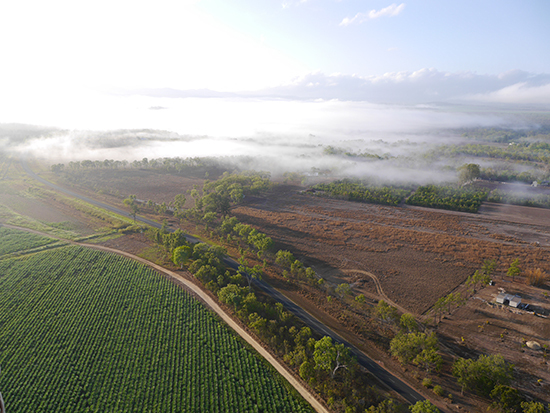 Beneath us stunned kangaroos gazed up at the yellow behemoth drifting above them, cars marched along the sparse Queensland tarmac in ant-like fashion and the rising sun reflected off dense mist as it weaved a path through fruit and vegetable plantations. 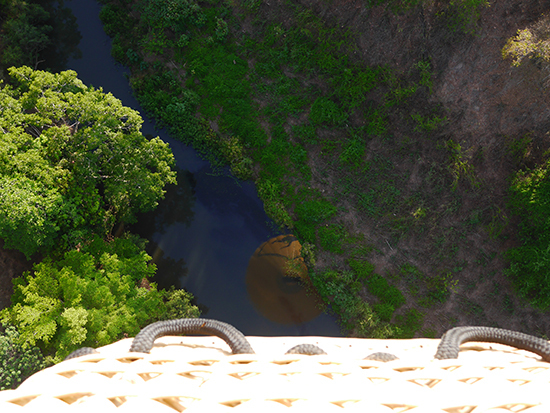 I’d never been in a hot-air balloon before and, quite frankly, I had no idea what to expect. Not even that, having just come off a 30-hour flight from London to Cairns (via Dubai AND Sydney) the day prior, the last thing I wanted was to be airborne again, let alone do it at the hideous hour of 5am. All that said; my grouchy, early morning demeanour didn’t last long once we were in the basket. 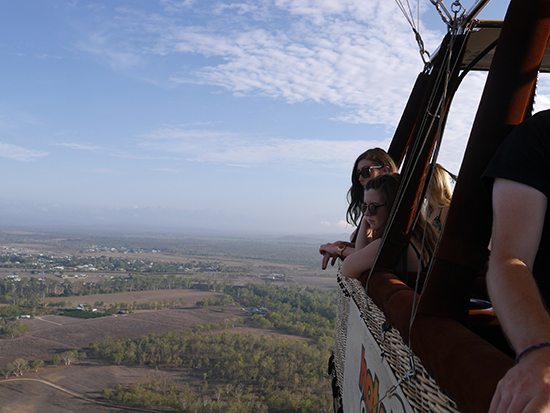 Within seconds we were effortlessly ascending skywards, lulled by a gentle breeze as we floated above the Atherton Tablelands, tickling fields of sugar cane with our toes. Our pilot Jay was undoubtedly head over heels for ballooning, so much so that he stretched our 30-minute flight to a 45-minute one, giving us some extra time to indulge in the uninterrupted serenity. Never have 16 people been so quiet. Spells of silence were only broken by the whoosh of burning flame or when Jay – who told us he’d been piloting for nearly two decades in Queensland and South Africa – stopped to point out the reflection of our balloon as it glided over a river or a field of kangaroos and wallabies. “It almost feels like you’re sneaking up on them,” he whispered, pivoting the craft so everyone could get a clear view of the wildlife below. 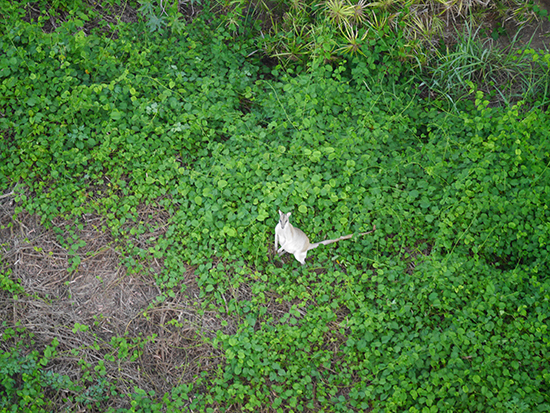 Marsupials weren’t the only ones giving us a nature show that morning. Birds swooped and glided alongside us and, as we grazed the treetops, our eagle-eyed pilot even spotted some rare avifauna, including an elusive species of cockatoo. Gazing out across the wide-open spaces of Mareeba and the Cairns Highlands as dawn broke, it was easy to see why these birds were attracted to this verdant region. After nearly an hour in the air, Jay delivered the unwelcome news that it was time for us to descend. He’d already earmarked a landing spot after radioing the ground crew and, as we drew closer to our target, he called for us all to adopt the touchdown position (basically a sporty combo of squatting and hanging on for dear life). We readied ourselves for two big bounces as the basket and ground met and within 30 seconds we were stationery, back amid the buzz of cicadas and infrequent passing traffic. Ungracefully I clambered out and onto the grass, followed by my basket-mates, and felt dwarfed as I looked behind me at the balloon. But that wasn’t the end of our experience. Our serene sunrise came at a price – and a hot one at that: we had to help get the floating behemoth down, and into its bag. It was a seemingly impossible feat when you compared the size of the two, but a bit of heaving, a lot of face-planting into nylon, and plenty of sweat later and we’d completed the challenge. It was a weirdly satisfying end to such a sublime experience. And despite my initial reservations, it hadn’t been a bad start to the morning after all. Ready to take to the skies? 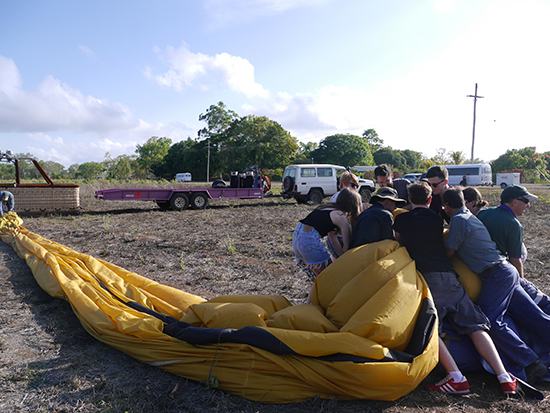 Speak to one of our Travel Experts about adding a hot-air balloon ride to your tailor-made Queensland holiday.